Our address is 125 Derham Road, Te Horo at Kapiti Coast. You can download as well or Directions from the North and from the South. How many Condos do you have ? We offer 24 Single Condos at the moment, but we plan to extend within the next few weeks or months. What is the Petzi Treat Cam ? The Petzi Treat Cam is installed in some of our condos in the Cattery and contains an HD camera, high-quality audio, and the ability to remotely dispense treats at the touch of a button via the Petzi app. Also, the iOS and Android apps allow you to interact with your cat, as well as share their pet pictures and videos via social media including Facebook, Twitter and Instagram. Mary`s CatVilla is the first to bring this Device to a Cattery in New Zealand to give pet parents the possibility to keep in touch with their cat(s) during holiday or long-term trips. When booking Petzi the Device is installed in your cats Condo. For privacy reasons, you can only see the Condo and your Cat(s). You can prepare yourself for using Petzi by following the instructions on our Info Sheet. What does your Cattery look like? Have a look at our Photo Gallery with a lot of photos. Do you have experience with pet first aid? 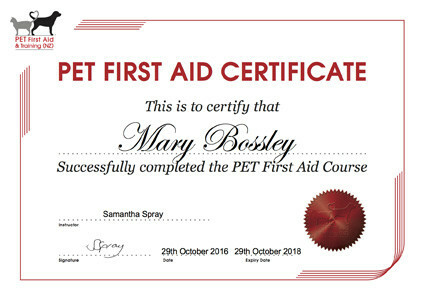 Mary successfully completed the Pet First Aid Course by the Pet First Aid and TrainingNZ Ltd in Wellington. What do your Condos look like? A Single Condo is 1,20×1,20×1,00 meter, and the cat has access for most of the day to a semi-community area. Our Condos have a connector to combine two Single Condos to one Double Condo. The maximum occupancy of a Condo is two cats. However, we recommend for two adult cats two Single Condos or a Double Condo. To learn more see the Description of our Condos. It is possible to Visit my Pet or Tour your Facility ? Our goal is that Pets staying with us feel as comfortable as possible. To accomplish that, we need your support. Usually, we recommend Visit Times that are shortly after or just before our Open Hours. But we try to be as flexible as possible. We would prefer not to disrupt the routine of the pets with too often. We have Feeding Times, Play Time, quiet time and as well Time for cuddling reserved during the day. A Visit can disturb this routine not only for your pet but for all the others in the Facility as well. To limit this disturbance, we prefer that only one visitor at a time is in the Facility. Sometimes we have cats in the Cattery that are shy or afraid of strangers. Since we know the personality of the cats staying with us, we can arrange that before a visitor arrive these cats have the option to go back in their safe spot (their condo). Visiting during Open Hours is possible, but we still ask that you make an Appointment. Open Hours are reserved for Pick-Up and Drop-Off and on busy days (such as peak season) sometimes several Drop-Off and Pick-Up can happen during open hours and we are not able to accommodate Visitors on some busy days. We would like to ask that you please not drop by unannounced or with only a short notice. It is likely, that we working on Tasks like Cleaning of Facility, Feeding, etc. Some of these Tasks include special protocols that are not easy to be switched immediately, for example, taking care of a Pet in Isolation or giving Medications. As well we, of course, have to maintain the property and run errands in town or pick up/drop off pets. Any other Options when my Cat is staying with you? Of course, for Cats, we offer the PetziCam. A Camera in your cats Condo, that allows you to see, talk to your cat and an option to dispense some treats. Especially for longer-stays you can stay in touch with your cat and check that your cat is doing fine even from the distance, all from your smartphone or tablet. When you would like to arrange a Visit, send us an email to info@catvilla.co.nz or give us a ring (or text) on 027 CATTERY. Please give us your name and the name of your pet and we call you back to arrange a visit or tour appointment. Visits and Tours are free of charge, but for Pick-Up and Drop-Off outside of Open Hours see our Fee Policy. What are your Open Hours and Appointment Policies? We offer Open Hours for Pick-Ups and Drop-Offs. On Public Holidays and other special days, the open hours might vary. Read our Latest News Articles about special arrangements for these days. To avoid unnecessary disruption to the pets staying with us, we recommend that you come within the designated Open Hours. The goal of our open hours is to maintain a calm environment for all pets. If you wish to come at any other time to drop off or collect your pet, this must be arranged in advance and an appointment time must be made. Be aware, that will cause additional stress for your pet and other pets staying with us. While we will do our best to accommodate your requested day and time, please note, that when you come outside of Open Hours your Pet might be ready and will wait for you in our office. For this reason, please come within a 15 Minute Time Windows around the scheduled Appointment. Appointments outside of Open hours for Pick-Up and Drop-Off will incur an additional fee of $20. Coming without an Appointment or being late to a scheduled Appointment will incur an additional fee of $20 ($40 in total). We know that special circumstances can happen and when this is the case, please let us know via Text or Phone ahead of time to ensure someone is available at the time of your arrival. What can you expect when your cat arrives? We will check your cat(s) vaccination proof in compliance with the Council regulations. Complete any paperwork that has to be filled out (I.e emergency contact, vet, etc). Then we will bring your cat within his/her carrier to the Cattery and place him/her in the assigned condo. So your cat can feel comfortable, As well we want that she do not notice other cats if possible at the time. Your cat will stay for a while in the condo to acknowledge that the condo is his/her “safe spot”. That is important to lower the stress for your pet to adjust to the new environment. We will monitor the new guest regarding food and water because when a cat starts to eat or drink it is a sign that he/she feels safe. Later on that day or the following day your cat can join the play time so that your cat can socialise with other cats in the semi-community area. Cats will acknowledge the community area as a “neutral zone” so that everyone can enjoy the Indoor/Outdoor areas without any territory issues. What are your Terms of Trade ? See details of our requirements and proceedings in our Terms of Trade. Can I manage my personal Details and the Details of my Pets online ? Yes, you can log in using http://www.catvilla.co.nz/login in our CatVilla Customer Portal. It is very easy to use and there is more than one way to manage your Details. In case you need some help, have a look into our User Help Document. Do you have an isolation area? Yes. The Isolation area is reserved in the case a cat should become ill while staying with us. See some photos of our isolation area in our blog post. Are you certified by AsureQuality? 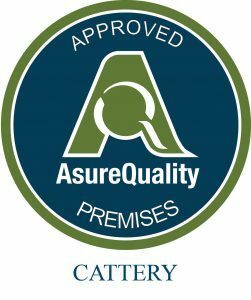 Yes, you can see our provisional Approval by the AsureQuality Pet Boarding Approval Programme here. What kind of vaccinations you require? Your pet must be current (including booster) on vaccinations (Panleukopenia, Respiratory Disease/Rhinotracheitis, Calicivirus) and proof must be sighted at the time of drop off into the Cattery. The last vaccination has to be given at least 14 days before the check-in. When this is not the case, please contact us in advance. Your Rabbit must be current (including booster) on vaccinations for Calicivirus. Other Small Animals did not require vaccination. Your dog must be current (including booster) on vaccinations (Canine cough, Parvovirus, Distemper, Hepatitis) and proof must be sighted at the time of drop off into Mary`s PetVilla. We recommend as well Lepto vaccination. See further details in our Terms. Did you offer Boarding for Dogs ? Please contact us, if you need Dog Boarding in the area.